This little patch of marshy water was the inspiration for a long walk last Sunday. It used to be be larger (you can see the earlier shape of it) and rather significant. It’s almost certain that this tale is a folkmemory of the earlier religious role of the pool. There’s evidence that the pool was a Celtic religious site, and the scene of sacrifice (some articles hint at human sacrifice, and one I can’t find anymore talked of the broken sword ritual) The Celts viewed standing water as a connection between this world and others. They also had a fear of bogland as a fearsome, haunted, wild area. Burial in bogland was a way of sending people to another world and preventing them from returning. 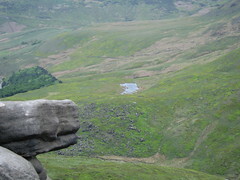 This pool is almost directly beneath the waterfall, and surrounded by the curve of cliffs that mark the boundary between this world (trees, sheep, fields, people) and the otherworld of the high moor above (wind, bog, stones, spirits). It’s a place to mediate between both worlds. When the folktale talks of a mermaid who grants life or takes life at Easter, the start of the old year, it doesn’t take much imagination to realise what probably went on in the shallow water of that pool. The mermaid lives on, even beyond the occasional visits of folklorist, neo Pagans and Forteans to the pool. Well and spring ceremonies still continue in many town and villages in the Pennines, often closely associated with the Virgin Mary, Christianity’s new name for the Mermaid. I should add that the modern day inhabitants of Hayfield are exceptionally nice and quite unlikely to perform human sacrifices in bogs.